Found right in the centre of Seville’s old town, this upscale offering dates back to the 18th century, occupying a private, tree-lined courtyard. And, it fulfils all the tenets of a Hospes property, combining modern luxury with authentic heritage. Think whitewashed chalk and exposed stonework matched with the likes of an innovative restaurant with floor-to-ceiling views and a rooftop pool, replete with tapas bar. With Seville’s lauded cathedral and world-wonder Alcázar within easy reach, it’s appropriate that the Hospes Las Casas del Rey de Baeza invites in all of the city’s traditional charms. And, this is perhaps best felt in the rooms, where artisanal pottery, shuttered windows and whitewashed walls evoke the Seville of old. That’s alongside all the usual modern amenities, from pillow menus to air conditioning and fine Egyptian cotton sheets. You’ll even enjoy a daily newspaper. In turn, upgrades mix in the likes of Jacuzzi-like tubs, rainfall showers and suite living rooms. The hotel’s privileged setting can also be tasted in the superb restaurant. Although inspired by Andalucian cuisine, chef Rafael Cantizano dishes up innovative, contemporary takes on traditional favourites. Expect everything from just-caught seafood to fresh truffle pasta and perfectly curated charcuteries boards. All are perfectly presented and paired with specially selected wines. You’ll also have the choice of taking your meal in the tree-shaded courtyard or up high on the hotel rooftop. In fact, the hotel’s head might just be considered its social heart, with the rooftop terrace host to welcoming sunbeds and a sublime pool – perfect for cooling off in the hot Andalucian sun. For more considered relaxation, head to the spa where you can enjoy a range of beauty treatments and massages. Then, perhaps cap it all off with a drink in the pool bar. Lastly, there’s the chance for some unique excursions, including Iberian ham tastings led by the resident chef. 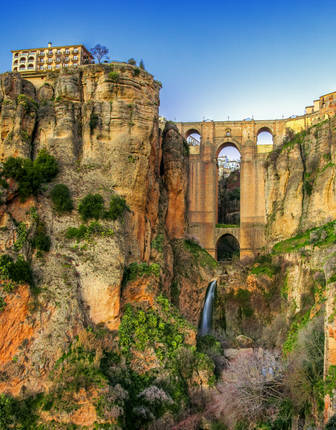 Knit together the world wonders of Andalucia with scenic drives, luxury palace stays and private tours included throughout.